The life of 43 years old Lu Decheng (魯德成), a Chinese truck driver, was changed forever 18 years ago on 23rd May, 1989 when he and two friends (Yu Dongyue (喻東嶽) and Yu Zijian (余志堅)) threw paint-filled eggs on the portrait of Mao Zedong (Chairman Mao) that hangs over Tiananmen Square in Beijing days before the shockingly sad events. For this act of defiance, Lu was sentenced to 16 years in prison on the charge of counterrevolutionary sabotage and incitement. His two other friends, Yu Dongyue and Yu Zijian (unrelated), were sentenced to 20 years and life in prison respectively. Since 1989, Lu Decheng has served nine years of Chinese prison (with treatment that were amongst the worst for people involved in the Tiananmen Square protests), experienced years of Chinese government surveillance & harassment and over a year in limbo in Thailand’s detention center. Now, Lu is finally a free man in Canada as a result of an emergency rescue by five generous and proactive Calgarians that sponsored him to come to Canada and the behind-the-scene effort of Canadian politicians and government officials. A series of raw and short documentaries will be posted in the coming days, weeks, and months to tell the stories of the three young men – Lu Decheng (魯德成), Yu Dongyue (喻東嶽) and Yu Zijian (余志堅), whose lives were forever changed and even destroyed. 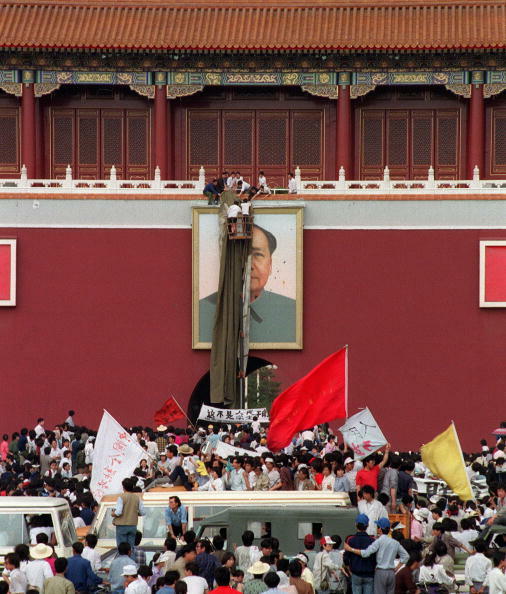 Note: Someone actually took the time to count the number of paint splash landed on Mao’s portrait. I have got that number in my notes somewhere. I will update the number in the banner if it is not 19.